1. 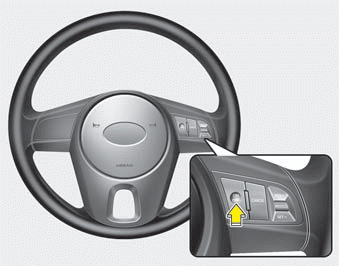 Push the CRUISE ON-OFF button on the steering wheel, to turn the system on. The CRUISE indicator light in the instrument cluster will illuminate. 3. Push the SET - switch, and release it at the desired speed. The SET indicator light in the instrument cluster will illuminate. Release the accelerator at the same time. The desired speed will automatically be maintained.